We wanted to celebrate my son's first birthday with family, friends and GREAT food so we turned to Chinese Dim Sum! My son is part Chinese and Chinese New Year was about to begin so it made perfect sense for us to theme the party as the Year of the Rabbit! Modern Bamboo! I thought it would be a fun pattern to play up in a contemporary graphic print. I accomplished this with the help of Kelly from WH Hostess and her wonderful paper party goods. 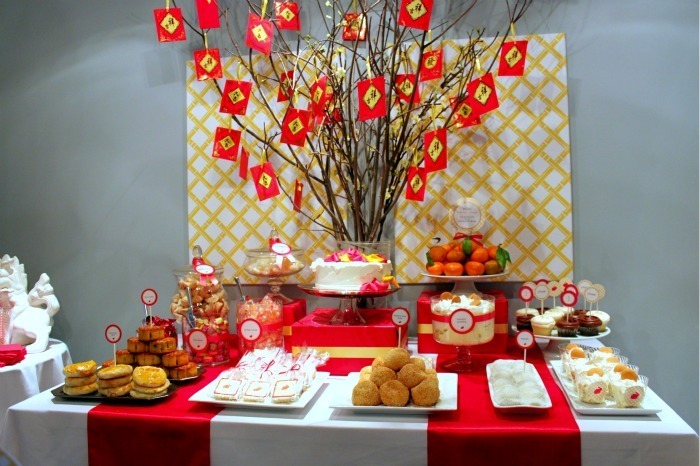 Obviously traditional Chinese New Year decor and foods such as red envelopes, mandarin oranges, Chinese candies, New Years sweets and desserts were very inspiring. It was important for me to keep parts of the party authentic while still appealing to american taste buds! I like it all but I lean toward contemporary and transitional with a little Jonathan Adler and some Hollywood Glam. When it comes to parties however, I like preppy and modern! Favorite DIY has to be the stretched canvas wall prints. I saved lots of money here and used Uprinting to create the rolled cavases. It then only cost approx. $15 per frame. The hard part was stretching the canvases. Well, it was easy actually. My fingers just hurt for a while. Should have bought the $20 clamp! I really appreciated how the cake turned out. It was store bought red velvet cake but with the help of my kids babysitter (aspiring baker), fun fondant fortune cookies were made to adorn the cake for a decorative impact. It was simple and easy to do. I also loved how well the Chinese sweets meshed with some of our family's favorite American sweets on the busy dessert table. Try something different every now and again! Taking the traditional and adding your own spin is what makes every party unique. While this was not your typical first birthday theme, it represented my family's Chinese heritage - something we could proudly share with our boys and friends. And that was very special to us! Melisa: Such a lovely party idea! I have never seen anyone who gave out a similar party that showed such love for their heritage, even though I have a lot of Chinese friends! I love the cake and the oranges as take aways. Chase looked like he’s having too much fun! what did you put in the gift bags?